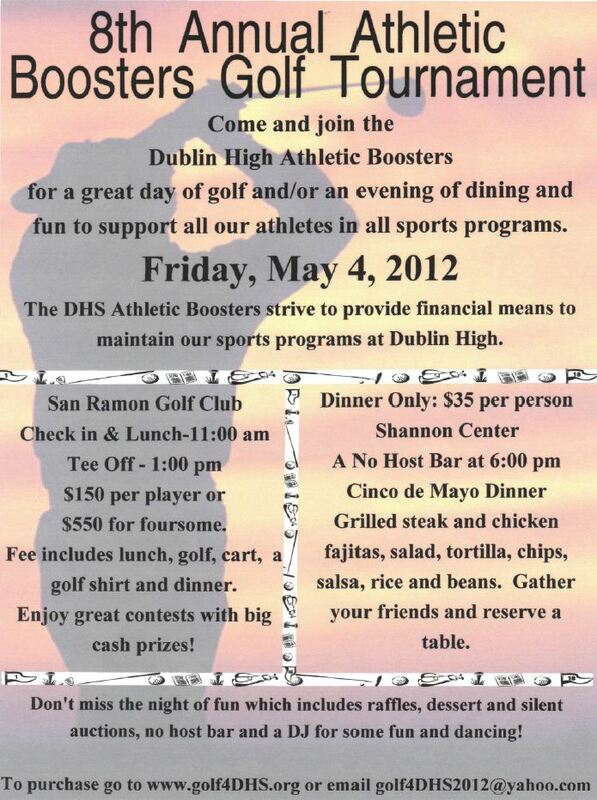 Hello Dublin High School Sports Fans! Congratulations to the DHS mens golf team’s 3rd place finish at the DLS tournament on the 12th. They have a 4-0 league record. Keep up the great work Gaels! Congratulations to Lady Gael swimmers Megan Fukamaki, Katie Grywczynski, Madison West, and Katie Somerville who took first place in their 200 meter Medley in a meet against Arroyo High of San Leandro and Newark Memorial of Newark. We are very proud of our long distance runners who took part in the Dublin High Distance Fiesta. Congratulations to Jillian Colwell who took 10th place in the 1600 meter run and to Justin Pryor who had a 14th place finish in the 800 meter run. Planning is underway for the 8th Annual Dublin High School Athletic Boosters Golf Tournament and Dinner/Auction to be held on Friday, May 4, 2012. The Athletic Boosters provide financial support for all 22 teams at Dublin High School, serving over 650 student-athletes, and also pay for the athletic trainers who assist the coaches and help provide rehabilitation services to all of the athletes (flyer attached below). All supporters will be recognized in the advertising and thank you information. If you have any questions or would like to donate, please contact Shari Jackman at 925.858.2500 or Mary Larsen at 925.828.7658 or email golf4dhs2012@yahoo.com. 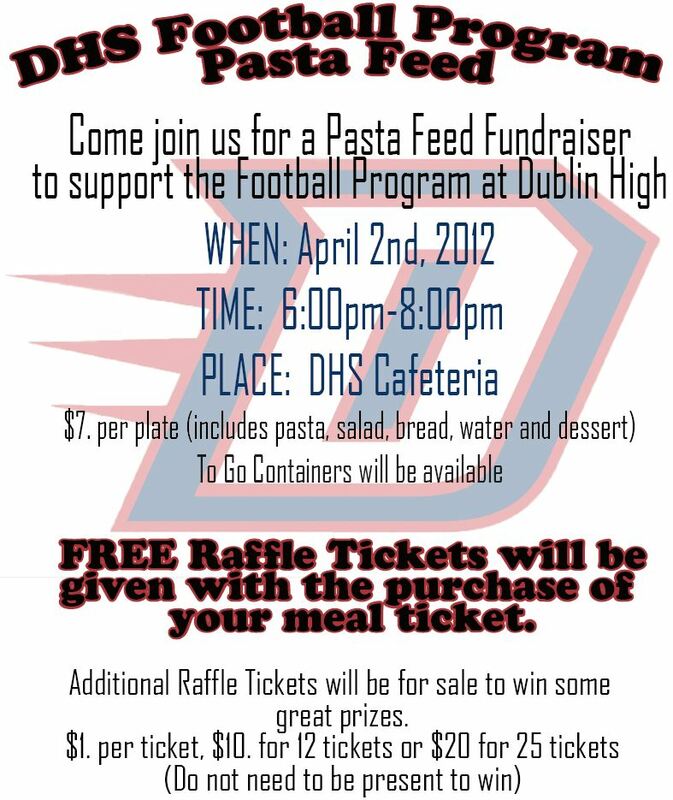 Attached please find a flier for the Football program’s Pasta Feed Fundraiser on April 2nd. Remember that March 23rd is the last day to reserve a space for the Varsity Baseball program’s Swap Meet on Sat. 3/31 to raise money for their Las Vegas Tournament. Please reply to this email to get more information. For Senior Athletes- the DHS Athletic Boosters have Scholarship Awards available. Applications can be picked up in the Career Center. Completed applications must be submitted no later than 12:40p.m. on Friday, April 20th to the Counseling Office with a copy of the athlete’s official sealed transcript. Transcripts take 48 hours to process so please submit your transcript request no later than Wednesday, April 18th to Ms. Watts. Transcript fees are $3.